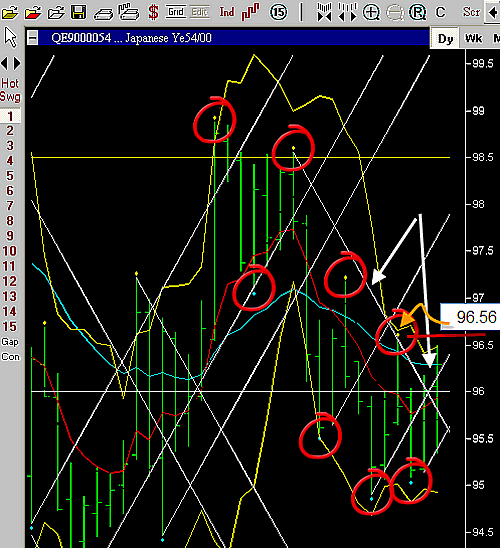 Last week we entered a short position on USDJPY as price dropped below our natural square level of 96.00. We entered 20 pips under this level at 95.80. How did the trade go over the past week? Lets look at the daily chart below and see. USDJPY Daily Chart 30 June 2009, showing 1 day swings. First, we look at the time vibration line broken to the upside. Vibration line is shown by white arrows. When we entered the trade to the short side we needed price to say under this vibration line. Any break to the upside means a potential upward reversal. Second, we became worried when price moved up above our natural square resistance level of 96.00. We did not want to see price move above this level again once we entered our positon short. Third, we look at the daily swing chart to see price break above the recent swing high of 96.56. This is shown by the red line and orange arrow. A break above the previous swing high shows the trend has changed. Price now by exceeding the 96.56 level, has caused an upward zig zag formation. A bullish formation. We now have three of our indicators showing that price is not as weak as we had anticipated. Hence, we now exit the trade at the swing high of 96.56. We can say we have confidence that price is showing some strength at least temporalily – which means we do not want to risk being in a short position. We are happy to exit the position and take a loss of 76 pips. Should we now take a long position? No! The two day swing chart is still in a down trend. The swing high on this 2 day swing chart is not broken so we are still in a down trend. We will now wait for another opportunity to go short again. We shall see how price moves over the next few days. Our goal is to exit bad trades as soon as possible without being wip sawed. Our goal is to stay in good trades for as long as possible, without giving back too much profit if it reverses. Over time using these methods we will capture some big moves that far exceed our small unprofitable ones. That is what swing trading is all about. “Capturing those big swing moves when they occur”.